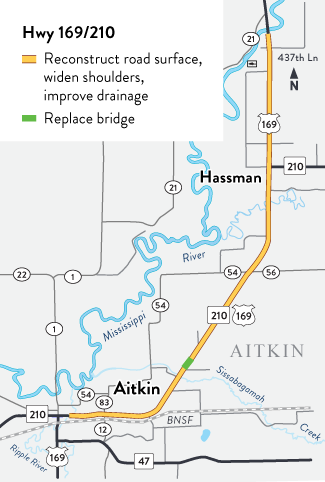 Plans are underway to reconstruct and widen shoulders on Hwy 169/210 from the Ripple River bridge east of 2nd Ave NE in Aitkin to the Mississippi River bridge north of Hassman, Aitkin County. Work is scheduled for 2022. Future project on Hwy 169/210. Click map for larger PDF version. Address the deteriorating pavement and narrow shoulders along this heavily traveled commercial and recreational route on Hwy 169/210, which averages 2,350 to 4,400 vehicles per day. Traffic approaches 8,400 vehicles per day within the City of Aitkin. The narrow shoulders are two feet wide, and are below today’s standard in providing adequate maneuverability and safety. More information to become available when closer to construction.